While Chris Jones worked at Lakeview Farms for several years in the mid to late 1980's, Heather Franssen only worked from 1988 to 1989. Evidently, that was enough. To my knowledge, these two are the only married couple who first met at Lakeview Farms. When Chris served as nuclear officer on the carrier George Washington in the Persian Gulf, the local TV station carried a cute home front / war front feature on the two and how they met with a background shot of our farm. I don't remember too much about Heather except that she was personable, a good worker and pretty good soccer & volleyball player at Ft. Zummwalt. Heather dropped by the farm ( about 1999 or 2000 ) to say hello but I did not recognize her -- the young teenage girl had become a stunning and poised young lady! 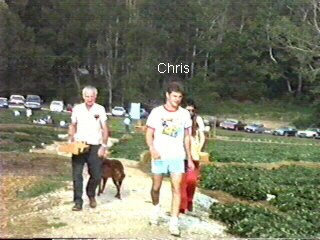 We have captured some VCR footage my wife Kathy took at our farm farm June 4, 1989 were going to caption it "When Chris Met Heather" but I had difficulty finding a scene where both were together so these two "still" pictures above from the tape will have to do.